Strengthening BU’s partnership with the Bloomsburg downtown community, the Greenly Center is located at 50 E. Main St. The 44,700-square-foot center is the home of the Bloomsburg University Foundation, with space for staff offices, the student call center, and meeting rooms. The university’s first permanent presence in the downtown responds to local residents’ requests for BU to become part of the Town of Bloomsburg’s main business district. The Greenly Center expects to bring an additional 4,000 to 5,000 visitors downtown annually. 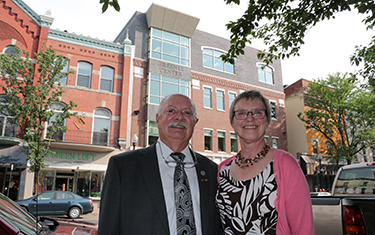 Construction on the $8.25 million building was made possible thanks to a generous $1 million gift from the Greenlys. “I believe the end result is one of the nicest building on Main Street. I am proud that our family name is associated with the university and town,” says Greenly. The four story building houses a first-floor art gallery, open to the public, as well as the university’s Office of Corporate and Continuing Education staff, classrooms for BU’s mini-courses, a 40-seat computer lab and a demonstration kitchen. Credit-based courses and programs for traditional and non-traditional adult students are planned for the center. Future plans include leasing available space on the third floor to a local business or community organization. Duane Greenly, a 1968 graduate of Bloomsburg High School, earned a bachelor’s degee from Bloomsburg State College and master’s degree from Morehead University in Kentucky. He enjoyed a successful career with Deering-Milliken & Co., BF Goodrich, Newell Rubbermaid, Morgan Door, Barry Controls and Ames True Temper an continues to work as a business consultant and mentor. He and his wife, Susan, a former special education teacher, have two children and two grandchildren.